As described in my previous blog about the first-time experience with the Makerbot, we encountered a problem where the extruder motor would stop moving after a while. Apparently there have been many discussions about this issue, such as here, here, and here. 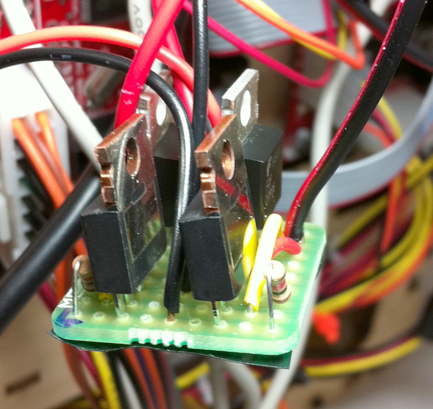 It seems to be generally agreed that the problem originated from the suboptimal performance of the extruder motor, particularly that its resistance can drop to close to 0 during operation, causing an overload current that fails the H-bridge (A3949) on the extruder controller board. I tried connecting a small power resistor in series with the motor and it still failed after a while. The 1K resistor R1 is a pull-down resistor (1/4W is sufficient). Its value turns out to be important, because the on-board A3949 H-bridge seems to have a pull-up resistor of about 70K. Thus even when the H-bridge is inactive, the motor ports (1A and 1B) are pulled up to +12V, which must be pulled down to well below 2V in order for Q1 (IRF510) to remain off. The 1K value works perfectly (if the value is too large, it won’t be able to pull the voltage low enough). 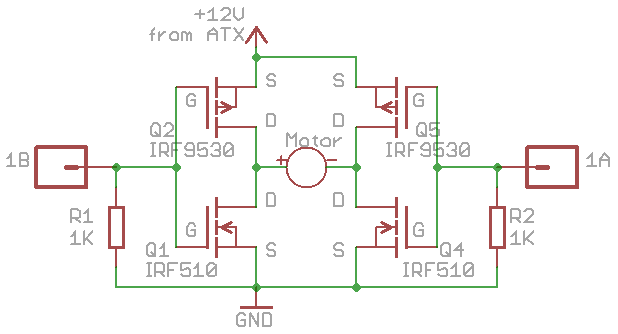 The reason IRF510 works is because it allows a high current (20A pulsed) to pass through it, which is much larger than what the A3949 chip can handle. 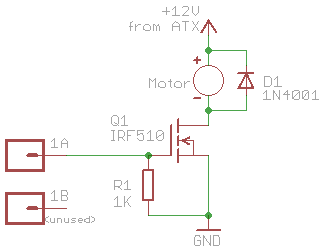 Using MOSFET, the main benefit is that the PWM works, hence the motor feed speed can be controlled and tuned in order to print out fine details of a 3D model. I was able to print several models with great details that I wasn’t able to achieve when PWM had to be fixed to 255 all the time. With this fix, the extruder motor can now move forward and backward, and PWM works in both directions! I’ve seen in several places that eventually the extruder motor should use a stepper as it provides much better control. But before that happens, I am sticking with my fix for now.